Welcome! You've found the best place for organization tips. I love your site and found it very helpful. Shelly: I landed on your ( organization tips ) site today, a prayer answered. I've not taken time before on any website because info seemed all over the place. Your visual eye catching 1-2-3 steps... just kept me reading and gaining knowledge to clear and confirm my mind. I trust I can now start to grow out of my clutter! Shelly: You have made a great resource for clients. Hi Shelly: Thank you for your email and your dedication to the professional organizing industry. Need help with your messy house? Need the best tips to declutter? Need information on how to simplify your life? Hi! My name is Shelly Morton, and I'm here to help you. YOU are the reason I built this website. My passion, my focus and my ministry is helping people get their lives back. You will find everything you need and more all in one convenient place! Tips on organizing laundry rooms. Information on how to start organizing. Get free stuff to help you sort, organize, prepare for upcoming travel and more! Straighten-Up-Now.com is ready to provide you with what you need! You can get your life back! The goal of Straighten-Up-Now.com is to help you find the best tips to declutter your home and your life. Consider this site your Messy Makeover headquarters! And . . . speaking of Messy Makeovers, stay up-to-date with the best tips by subscribing to our monthly newsletter Messy Makeover Magazine. As the Chinese proverb says . . . a journey of 1,000 miles begins with a single step. So . . . let's make a start and take the journey together . . .OK? If you're a Newbie to home organization, click on the Start-Here button. This is a great place for anyone needing to know where to begin with their home organization solutions. Or . . . if you'd rather just jump right into a home organization project . . . click on any one of the buttons to the left to get information on the project area you need help with. Whether you need help with organizing a kitchen, how to organize your magazines and books (or anything else). . . you should find what you need here. During our journey, you will find both the high-end (more expensive) solutions as well as low cost and (even better) no cost home organization tips as well. You will find tips on savvy software solutions as well as more low tech ideas to accomplish the same thing. If you don't find what you need, please go to the Contact Me section. Feel free to submit a question or ask for what you need. I'm here to help! Ready? It's time to find those home organization tips. Straighten-Up-Now . . . it's time to get organized!! WHAT'S THE LATEST IN ORGANIZING NEWS? Get the latest in organizing tips. Sign up for free newsletter. Simply the best-of-the-best home organizing tips! Get organized for life! You deserve it! Site-Map for Straighten-Up-Now.com. Easy to use site map. Alphabetized for convenience. Find your way around Straighten-Up-Now.com! Book reviews of organizing, time management and other do-it-yourself books. Submit your own review. Suggest other helpful books. Great time and money saver! MESSY MAKEOVER MAGAZINE -- SUBSCRIBE TO THE FREE NEWSLETTER TODAY! Messy Makeover Magazine. Free once/month newsletter. Get product reviews, receive the latest organizing tips, tricks and hints. No advertising -- no selling of your information. Subscribe today! Top 10 reader home organizing tips. Check back often -- updated frequently. Free gift for submitting your own tip! Home-staging? Selling a house? These home staging tips will help you get a leg up on the competition. Sell your home faster! Selling crafts can be fun and profitable with the right knowledge. Learn how to organize for a craft show. Free check list. Craft business do's and dont's. Links to craft show directories. How to videos on home organizing. Don't search all over the Internet. All the tips, videos and information you need are here in one place! Start Here! Easy home organization tips and home organization solutions. Best tips to declutter. Your Messy Makeover Headquarters! ORGANIZING TIPS. ASK AN EXPERT! Organizing Tips? Ask an expert professional organizer! Get advice specific to your situation. Read what others have said. Get the help you need. Free service. You can share your wisdom! Bill organizers help you save time and money. Learn good bill paying techniques. Learn how to set up a bill paying system that works for you. Organize me. Find a professional organizer in your area. U.S. alphabetical listing by state. Your baby needs many things, so get ready with the great information here. Learn about nursery design, infant safety and preparing for your baby. ORGANIZING-KIDS -- TIPS TO TAME KID CLUTTER! Organizing-kids. Tips for taming kid clutter. Back to school organizing. Kids room organizing tips. Create an organizing learning center. How to Organize a Closet -- If you're tired of the avalanche of clothing every time your open your closet door, read these 1-2-3 easy tips to organize your clothing and closets! A closet organizer system can help clear clutter. Learn tools, tips and step-by-step instructions to make your closet your favorite place to shop! Home office organization is easy when you know how. The tips on this page will help you get started. Get your home office cleaned up and ready to go quickly and easily. Entertainment storage info. Book display & storage tips. Find declutter tips & info. Help with media storage. Storage solutions for hobbies & crafts, sports equipment. Magazine Management & more! Organizing a craft room? Craft supplies taking over? Craft area cluttered? Feel frustrated and uninspired? Use these handy tips to organize your craft area now! Organizing your kitchen. 5 Tips to help you get your kitchen organized now. Find out how these laundry room organizers can save you time, energy and money. Get your laundry done faster with these great tips. Get help organizing a kitchen. How to organize a kitchen information. Kitchen storage solutions and kitchen storage ideas! Sports equipment storage can be a problem. Learn tips and clever storage solutions for closets, laundry rooms, garages and more. How clean is your car? If it's a mess, these car organizer tips will help you tidy up! Great tips for a tidy vehicle. Garage organizing 101. Free easy tips and instructions for a garage makeover. Learn why a clean garage can increase your resale value and give you added entertainment space. Jewelry organizers are great, to a point, but how to you organize jewelry? Great 1-2-3 steps on jewelry organizing, care and cleaning. Tired or rummaging around in your drawer to find that favorite tube of lipstick? Get the best tips for cosmetic organizers here. Cluttered purse? Can't find that ringing cell phone in the bottom of your bag? The handy purse organizer tips on this page will help you get and keep your purse in shape! House cleaning tips! Learn how to clean a house. Get tips for spring cleaning. Best cleaning tips, hints. Food preservation and storage tips. Food safety tips. Learn to avoid food contamination. Pantry organizers. Great laundry tips. Find laundry room organizers. Learn how to do laundry. How to organize your laundry room. Save time with great laundry information. Causes of stress. Top 10 Causes of Stress. 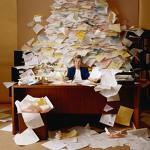 Does "Mess" equal "Stress?" Learn ways to have a more peaceful environment. Helpful declutter articles related to home organizing. Reasons why we procrastinate. Hoarding disorder and more. Helpful articles on various home organizing topics. Break the clutter cycle. Add value to your home. Benefits to organizing your kitchen. Psychology of a Pack Rat. Productive procrastination. How to manage time. What is time? How can you manage your time better? Learn how to manage your time effectively. Learn how to find and set your true priorities for greater productivity. How to set goals? Larn how to set and achieve any goal. Create a personal strategic plan. Get your New Year resolutions in shape. Goal setting tools and information. Organizing for the holidays. Plan now to reduce seasonal stress. Enjoy your holidays more with these holiday tips. Get tips on organizing for Thanksgiving, Christmas and more! History of Mothers Day. Want to know more about the history of Mother's Day? This article will inform and enlighten. Comment on what it means to be a woman in this century. Remodeling estimates? Weigh the cost of remodeling versus buying another home. Free remodeling budget calculator. Why remodel? Tips on remodeling budgets and estimates. Before and after photos of assisted living remodel. Organizing for senior citizens, special needs and people with disabilities. Website testimonials for straighten-up-now.com. Find out what others are saying about the great information found on this website. Free stuff! Everybody loves freebies! Get free organizing checklists, travel checklists and other free organizing helps! More than just declutter tips . . . here are some fun stuff!! Have fun with organizing. Feel free to contribute an original song, joke, poem, picture! CONTACT ME FOR GREAT ORGANIZING TIPS! Email tips. Inbox over-flowing? Too many emails or texts? Learn how to manage your email inbox and prioritize messages. Inbox help is here!